Smart syringes that break after one use should be used for injections by 2020, the World Health Organization has announced. Reusing syringes leads to more than two million people being infected with diseases including HIV and hepatitis each year. The new needles are more expensive, but the WHO says the switch would be cheaper than treating the diseases. More than 16 billion injections are administered annually. Normal syringes can be used again and again. But the smart ones prevent the plunger being pulled back after an injection or retract the needle so it cannot be used again. 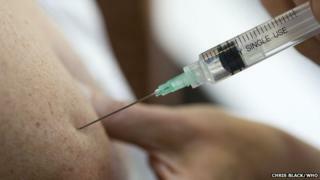 Dr Selma Khamassi, the head of the WHO team for injection safety, told the BBC News website: "This will hopefully help eliminate the 1.7 million new hepatitis B cases, the 300,000 hepatitis C cases and the 35,000 HIV cases every year, and all those we don't have figures for, such as Ebola and Marburg." The people of the farming community of Roka in Cambodia are living through exactly the nightmare scenario that the World Health Organization wants to stamp out with a new policy on syringes. In wooden huts and farmhouses dotted among paddy fields, families are struggling to cope with the bombshell of a sudden and frightening mass infection of HIV. To the astonishment and shock of this rural backwater, babies, schoolchildren and even the 82-year-old abbot of the local Buddhist temple, who is celibate, have all tested HIV-positive. And there is one common factor that links them, directly or indirectly: nearly all of them received injections from an unlicensed doctor suspected of reusing his syringes. The virus would have been spread from one patient to another, resulting in an escalating tally of infections that now stands at 272, with further rises expected as more tests are carried out. Four of the victims - three elderly women and a baby - have since died. This is also a problem in rich Western countries. An outbreak of hepatitis C in the US state of Nevada was traced back to a doctor who used the same syringe to give anaesthetic to multiple patients. Standard syringes cost between two cents (1.3p) and four cents. The smart syringes cost between four and six cents. The WHO describes it as a "small increase". However, the tiny difference in the price of one needle becomes huge when it is scaled up to 16 billion injections. Dr Khamassi added: "Injection safety is, I think, the most cost-effective way to prevent all these diseases. "If we compare the price of most expensive syringes to the cost of treatment for an HIV case, or a hep C case, there is no comparison." The WHO is also calling for sheathed needles that prevent doctors accidentally pricking their fingers. This has happened many times during the Ebola outbreak in West Africa. But they would treble the cost of the syringes and the WHO says these would have to be introduced "progressively". The WHO is calling on industry to expand production and find ways of reducing the cost of the safer needles. Marc Koska, head of Safepoint - which campaigns to stop the reuse of syringes - told the BBC: "It's totally, totally possible. "We've already done this with immunisation, which represents less than 10% of the injections given in the developing world, and that has been a fantastic success. "Now we're targeting the 90% of what we call curative injections." But the measure will not be the end of the typical syringe. They will be needed for needle exchange programmes for drug users as well as in some treatments in which multiple medicines are mixed in the syringe before being injected.